On our routers (or multilayer switches) we can use access-lists or firewalls (CBAC or zone based) to permit/deny packets that go through or to the router. We can also use policing to rate limit that goes through our router. Routing protocols like OSPF, EIGRP, or BGP. Gateway redundancy protocols like HSRP, VRRP, or GLBP. Network management protocols like telnet, SSH, SNMP, or RADIUS. Packets that CEF can’t forward. 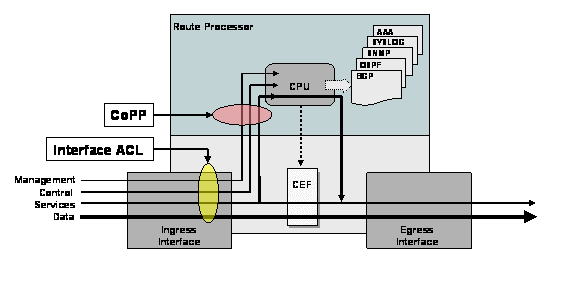 The route processor inspects packets that these protocols generate on the control plane. When the route processor receives too many packets, it’s possible that it can’t keep up and drops packets. When this happens, you’ll see things like flapping neighbor adjacencies or timeouts when you try to connect with telnet/SSH to the router. rACLs (Receive Access Control List): these are standard or extended ACL that control traffic sent by line cards to the route processor. You only see this feature on high-end routers like the Cisco 12000 series. Control Plane Policing (CoPP): allows you to use MQC (Modular Quality of Service) framework to permit/deny or rate-limit traffic that goes to the route processor. In this lesson, we’ll take a look at CoPP (Control Plane Policing). R1 and R2 run OSPF and HSRP. R1 is configured for remote access through telnet. H1 is a host that generates ICMP and telnet traffic to test CoPP on R1. DSCP or IP precedence values. In the policy-map, I add policers for 8000 bps and the conform-action and exceed-action are both set to transmit. These policers will never drop anything but there is a good reason I configure it like this. When you configure CoPP for the first time, you don’t know how much packets you receive for each protocol. There is a risk that you deny legitimate traffic. It’s best to permit everything. Once you know how much packets are exceeding, change the values and set the exceed action to drop. Interesting topic and good explanation. From what I understand with control plane policing and protection we create a filter between the interface and the CPU to filter packets handled by the CPU of the router. which is enabling policing for incoming traffic to the router, an incoming ssh packet for example to the router will not be dropped but will not be under inspection either . I was reading about CoPP and I read on a forum an example on why to use it. It was mentioned that if for example you want to filter traffic to an outside interface with an access list , and someone manage to send a lot of traffic to that interface , even though the traffic will be dropped as it matches the drop action in the access list ,this will have an impact on CPU . On the other hand with CoPP you will have a silent drop meaning packets will never reach CPU . This is a very important aspect that you bring up. There are several things that come into play. The documentation really helped me a lot as well.